Japan is the perfect country for a solo female traveler to visit. It’s extremely safe, people will leave you alone, the culture appreciates the value of being alone and doesn’t shame anyone for introverted traits. While Tokyo can be a bit of a crazy city population-wise, it’s still peaceful at heart and there’s lots to do and see for a solo traveler. Most capsule hotels are strictly for men, but there are options for women in the city. If you use Booking.com, you can find lots of options for affordable accommodation that cater to women or are coed. Capsule hotels are odd little beasts and everyone should try one once in their life. It’s not as claustrophobic as you’d think. You get a nice, contained space that sometimes comes with amenities like TVs or radios. The photo above is from Booth Net Cafe & Capsule, one of the spots I stayed in. They had a separate floor just for female visitors, which had a beautiful vanity room with face wipes, q-tips, hair dryers, and a huge mirror. It was also right in the heart of Shinjuku, which is a very central area of Tokyo to stay. In Japan, eating by yourself is extremely common. No one looks down on you for doing it and all eateries welcome solo diners. It’s perfect for the person who may feel conscious about being alone. Truthfully, you can walk into any establishment and get an amazing meal, but here are some options for if you know no Japanese or just want some ease of choice. Just use Google Maps to search for conveyer-belt sushi near you and head to the closest one for an all you can eat feast of this tasty food. 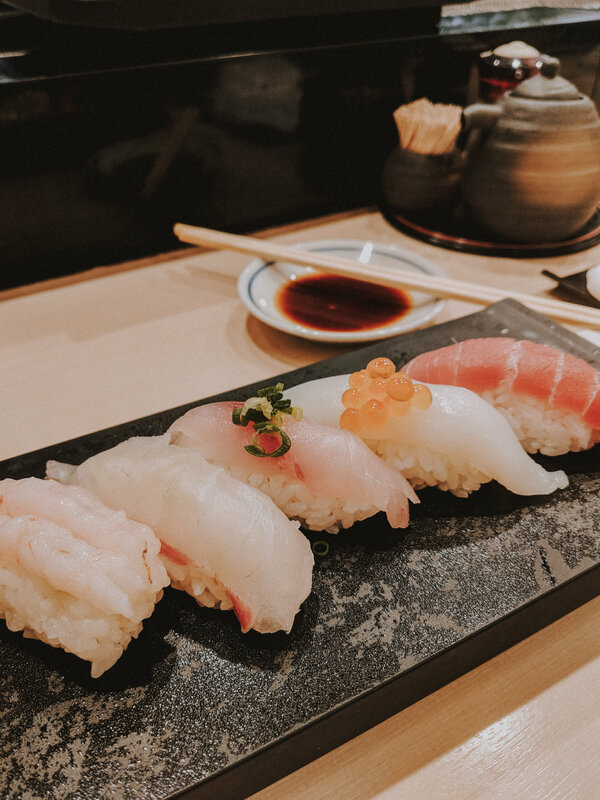 Sushi isn’t for everyone, but you should definitely try it when in Japan because it’s different than getting it anywhere else. At some sushi restaurants, you order from a menu to the chef who makes it for you, but if you don’t want to have to talk to anyone, find a place that has the sushi going around the room so you can grab it off as it passes you. There are also venues that provide a virtual menu so you can order and it will bring it to you on a little train cart. It’s like magic. This has to be the best ramen in Tokyo. It’s the perfect blend of flavors and there’s multiple branches all around the city. And the best part? You don’t have to speak to anyone! You order from a machine, then you go sit at a one-person booth that has a little partition between you and the kitchen. You leave your order ticket at the window and an anonymous cook will come take your order and return within minutes with your customized bowl. They shut the curtain and you can enjoy your meal in peace. If you don’t have the time to stop and eat grab some street food as you walk around the city. There are millions of choices, so I won’t get into them all, but basically anything you try will be great. Something fun I found in the Akihabara district on my latest trip was this taiyaki fish treat which was in the shape of the Pokemon, Magikarp. If you want the most quaint and affordable tea experience ever, head to this florist that has a tea shop hiding in the back. It’s so beautiful to sit amongst the flowers and drink tea that you’ll forget you’re in the middle of Tokyo. In the summer of 2018, two incredible exhibits popped up in Tokyo that everyone should experience. Borderless and Planets. Both are interactive, art museums that take you to another place. They’re a bit on the pricey side and tickets should be bought well in advance so they don’t sell out on the day you wish to visit, but they’re incredibly worth it. If you’re alone and need a way to kill half a day, each of these will transport you to the most whimsical of spaces. If you don’t have time to go to Kyoto, or just want a peaceful place to walk around for awhile, go to the Hie Shrine. There’s orange torii gates like you can find near Kyoto and a lovely temple as well. It will make you feel like you’re not even in Tokyo anymore with the nature surrounding you. For a birds-eye view of Tokyo, and just to add a lovely splash of rainbow to your day, go to Palette Town in Odaiba and ride the ferris wheel. On a clear day, you may even get a great shot of Mount Fuji. This temple may be the top of most people’s lists when they visit Tokyo. While it’s not the only one in the city, it’s perhaps the most famous and attracts the most visitors. If you don’t have much time to get out of the city to more rural parts of the country, this may be your only chance to see a Japanese temple in its most beautiful glory. If you have some time to kill and extra coins to lose, head to Akihabara and waste your money on some claw machine games. It’s almost impossible to win, but you’ll have fun trying your luck. There’s literally endless things to do in this city, so if you need anymore inspiration, check out this article I wrote for Popsugar on things to do in Tokyo. You can also watch footage from the two teamLab exhibits I went to in the video below. Sayonara!